As part of a nutritional program, supplements are often supportive. There is a new field of science that has emerged entitled "Nutrigenomics:"
Research suggests that nutritional interventions may play a key role in addressing many autoimmune diseases. Many people who already are symptomatic, even if not yet suffering from chronic or autoimmune disease, have had nutritional deficiencies for such a long time that they initially need support greater than what their diets can provide. In addition, the environmental challenges that we face today - the depletion of our soil, the toxins that we breathe and eat and the daily emotional and economic stresses we experience necessitate higher intake of nutrients beyond what can be obtained from our diets. 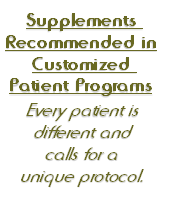 Therefore, initially a supplement program can help to boost deficiencies and ease some symptoms while permanent nutritional and lifestyle changes are in process. Over the past 20 years, I have attended many nutriceutical conferences to learn about the different supplements on the market and how they can be used in therapeutic programs. I recommend products from professional nutriceutical companies as well as from local Health Food Stores. In addition, I also use products from several network distribution companies.